Image: Marvel Comics. Secret Empire Free Comic Book Day #1 cover art by Mark Brooks. 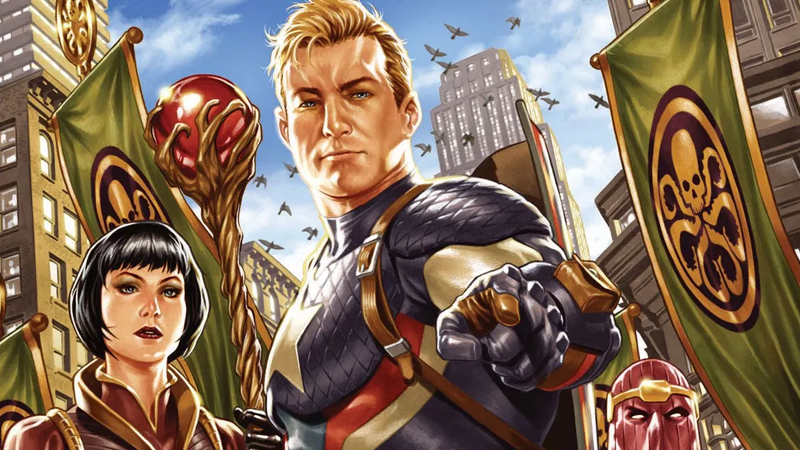 In a few weeks, Marvel will kick off Secret Empire, the culmination of a year-long arc that has seen Steve Rogers, a walking symbol of American exceptionalism and patriotism, revealed as a life-long agent of a fascist supervillain organization. But aside from that minor detail, they’d really like you to know that somehow the event is not inherently political in the slightest. Secret Empire shares its name with a previous Marvel event, a ’70s Captain America storyline by Steve Englehart and Sal Buscema in which a mysterious evil organization infiltrated the highest levels of American government. Written in the wake of Watergate, the story had high political resonance, but Spencer and Marvel editor-in-chief Axel Alonso insist that this Secret Empire has little to do with contemporary political parallels. It’s an age-old battle of good vs. evil, with the top superhero in Marvel history on one side, and all his friends and teammates on the other. That’s right, everyone. Unlike the past Secret Empire storyline—which included a moment that heavily implied that Richard Nixon himself was the head of a shadowy cabal ruling the White House—this new story is a “good guy versus bad guy” brawl with little to no political leanings or commentary. Except, if you’ve been reading Spencer’s work on Captain America lately (which, wider controversy aside, has been surprisingly gripping to follow), you would know that this sentiment is an extremely baffling interpretation of what Secret Empire is about at its very core, and why the event has become such a controversial talking point. Putting Spencer’s work on the extremely politically-minded Captain America: Sam Wilson series aside for a minute, this is a story arc featuring Steve Rogers—a super soldier bred to win World War II and an icon of freedom, justice, and the ideals America sets for itself, a comic character created with explicitly political intentions that even lead to his creators, Jack Kirby and Joe Simon, to be offered police protection to avoid being assaulted by actual Nazi supporters—being revealed, even through cosmic-cube-reality-altering-shenanigans, as a life-long agent for an organization that, even ignoring their murky historical associations with Nazism, is explicitly an organization that wants only the strongest to rule the world through terror and dominance. Whatever Alonso and Spencer say, this twist, at a time when people are looking towards Captain America as an important symbol of the beliefs they cherish, is an inherently political one that is also very much rooted in current world events, and current politics. Further on, in the biggest teaser for what was to come in Secret Empire so far, the imagery of Hydra’s takeover of the US is presented in an inherently political manner: control of the media, frequent security checks, propaganda-as-patriotism in the heart school classrooms. Although not pictured in the page below, the issue it comes from, Civil War II: The Oath (also penned by Spencer), even includes a direct parallel to internment camps. To deny the inherent political nature of this event and the current context that it is deliberately rooted in—presumably in an attempt to quell the ongoing controversy Marvel faces over Secret Empire—is to deny the facts of reality itself. Art by its nature is shaped by the beliefs and agendas of its creator. To say that this new event, couched in the imagery and language dominating American politics in 2017, has ‘little to no’ political parallels is as boldly untrue as saying something like Star Wars is unpolitical. Don’t get me wrong, all this does not bear on Secret Empire’s quality—I’m looking forward to seeing how the culmination of this long saga turns out. But Marvel should at the least be honest with its audience about the story it is telling, especially if it expects the controversy surrounding it to die down any time soon.